An advanced online safeguarding training course written specifically for the equestrian sector in association with the British Equestrian Federation. This course is aimed at equestrian coaches/instructors or anyone else who has already completed a British Equestrian Federation face-to-face safeguarding course and wishes to refresh their knowledge. This course covers both child and adult safeguarding including topics such as being person-centred, making referrals and handling allegations. 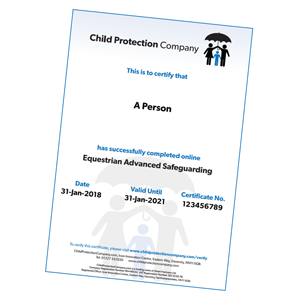 The Equestrian Advanced Safeguarding online training course can be taken by equestrian professionals who have previously completed a British Equestrian Federation face-to-face Safeguarding course. However, if you are working as a Safeguarding Officer in the equestrian sector then you should take our Equestrian Advanced Safeguarding for Safeguarding Officer course. If you require only an introductory level course you should take our Equestrian Basic Safeguarding Awareness course. Please note: It is a requirement of the British Equestrian Federation that professionals attend a BEF face-to-face safeguarding training course within the 3 years prior to taking this Advanced course as refresher training. I work in England/Wales/Scotland/Northern Ireland. Is this course suitable for me? This course covers the safeguarding requirements for England, Scotland, Wales and Northern Ireland. When you begin the course, you will be offered a choice of location. Your learning channel is designed to meet the needs of local safeguarding legislation and guidance depending on the country you select. Sadly, abuse and neglect do happen in sometimes surprisingly large numbers. Often, children and adults at risk will find it hard to speak to someone about the abuse they are suffering, or they may have very few people who will listen. The stables may be the safe haven they need to encourage them to open up to someone about their situation. This module will look at what child protection and adult safeguarding actually mean, should you find an individual discloses something to you, or should you suspect there is a problem. On completion of the module, you will have a much better understanding of key words and phrases and how they relate to safeguarding. Safeguarding and protecting children, young people and adults at risk must operate within a framework of guidance and legal procedure. This module offers an overview of the framework of protection and how it is applied, and takes into account guidance from the British Equestrian Federation on your duty of care. Of course, you will not be expected to be able to quote detailed laws directly, but you will gain a general understanding of what they are. By the end of the module, you will have a much clearer understanding of safeguarding guidance and the legalities of protection. The module also introduces the Safeguarding Officer role. Module 3 - What is Abuse and Neglect? At the end of this module, you will have a better understanding of what we mean by abuse and what the specific areas of abuse are. Children and adults experiencing abuse often find it very difficult to talk about the abuse they are experiencing. The anxiety that they feel may manifest in different ways, such as displays of challenging or changed behaviours, and we need to be able to recognise these signs of abuse. Abusers are often adept at covering their tracks and may appear to be very caring people, so recognising the signs of abuse can often be the first alert to a situation. A person-centred approach is vital when dealing with safeguarding issues. This module looks at what makes a child/adult an individual and how putting them at the heart of any safeguarding process can best meet their needs. This part of the course builds on the work we did in earlier modules around the signs and different types of abuse and maintaining a person-centred approach. Individuals can disclose in a number of ways, so, while you want to maintain confidentiality where appropriate, you also need to know when to report and to whom. It is vital that you respond quickly and appropriately when presented with a disclosure of abuse, and this module covers the right process to follow and what to do (and what not to do) in order to achieve the desired outcome. By the end of this module, you will have further understanding of the process for complaints and how to process a complaint or allegation in the right way. You will now take all that you have learned and apply it to an assessment of your knowledge. The final assessment is your opportunity to show how much you have absorbed and why it is so important to have child/adult protection and safeguarding training.